Get ready to cook some amazing foods like, peaches and cream pie, pancake, fresh juice, and BBQ! 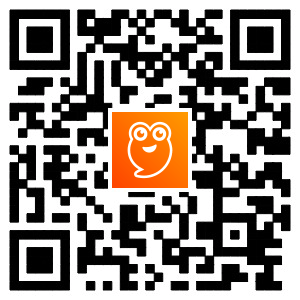 With this great cooking game you can create an own food recipes! You will able to cook and learn a variety of cooking techniques. 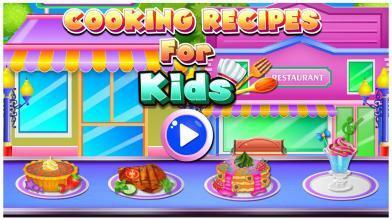 Improve your cooing skills with this great cooking game! 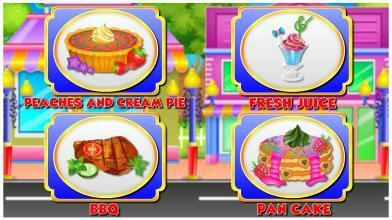 In this kids cooking game make delectable and yummy foods. Simply collect all the ingredients! Here you can collect all the ingredients, prepare them mix and cook them, and then prepare and decorate your yummy food ready for the final cooking and eating stage. Peaches and cream pie To start the peaches and cream pie, first you need to add some ingredients like, wheat flour, baking powder, milk, butter, salt, vanilla powder and egg. Then transfer to another bowl. Next you have to add peaches sugar, cream, peaches cream and ground cinnamon powder then mix all the ingredients. After that bake the peaches and cream pie. Finally add cream, fruits, candies, colorful sprinkles, juice and toys for decoration. Pancake To start cooking pancake first you need to add some ingredients like, wheat flour, sugar, salt, milk, butter and egg. Mix all the ingredients and bake it in tawa, make sure it does not burn while baking! Once it’s ready, decorate is with huge collection of creams, cookies, fruits, Choco chips, toys and many other decorative items. Fresh juice Juice is a favorite drink for kids! Select a favorite fruits like, strawberry, grapes, apple, banana and more! Extract juice blend with ice cubes. Added sugar, milk and water. Grind the fruits and ingredients then transfer to customizable cups and decorate the fresh juice like, Choco chips, face design, cream, toys and many more! Then serve the yummy yummy fresh juice. BBQ First you have to select your favorite food like, barbecue and skewer. Then add some cooking ingredients like, barbecue sauce, brown sugar, pepper and salt. Few minutes marinate the barbecue. After that you can cook the barbecue. Finally add some decoration items like, sauce, vegetables, potato fries, fresh juice and toys. we will add more recipes soon.